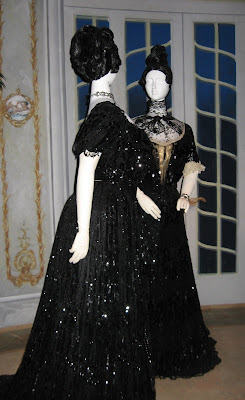 1898 Dresses from American Woman: Fashioning a National Identity at the Met in 2010. Well, at least I got one. The black dress with the sequins, on the left, was one of my favorites from the show. 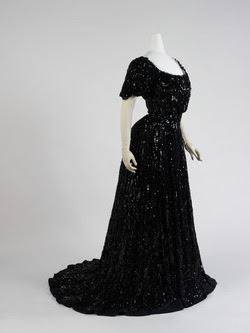 I don’t think of dresses from that period as being festooned with sequins, and yet this 1898 dress was a gorgeous subtle sparkler. Fast forward to today and, as Rachel Zoe would say, “I love me a sequin.” Here is a J. Crew sequined cardigan I bought last year that I’m determined to wear more this fall and winter. I love how the sequins are sewn in straight lines up and down the sweater. Consider this post your sparkly invitation to join Adrienne of The Rich Life (on a budget) and me in our “How I Wear My: Sequins” post on December 1. If you’d like to show how you wear your sequins, send either of us a photo of yourself in your finest sequined attire or the name of your blog, or both, so we can include you in all the glittery gleaming fun! Wonderful dress and divine cardigan. See if I can find some sequins for December the first to join you. You look great in the cardigan and I am going to try to join you on December 1!! I love sequins!! You are a photojournalist after my own heart! Snap it any way and apologize later!!!! I think that cardy/cardi (what did we decide about the spelling?) looks great on you. I hope you do get a chance to wear it lots this season. 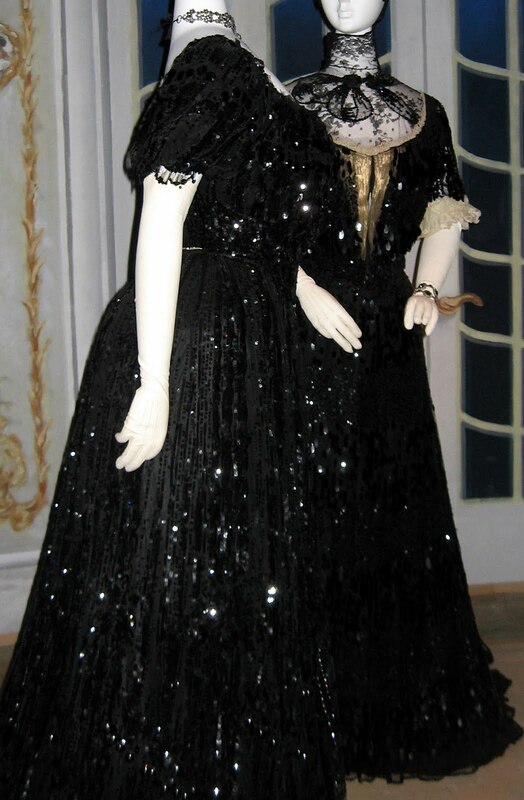 Interesting about how "blingy" those dresses were from 113 years ago...who knew? Hi Adrienne my dear! You know I am a stickler for spelling so I vote for cardi (and will probably still be calling it a cardigan). And yeah, that dress was so gorgeous, the rest of the dresses from that period on display were silk, some were embroidered but only those two were sequined.